All preferences for the DNS-over-HTTPS functionality in Firefox are located under the "network.trr" prefix (TRR == Trusted Recursive Resolver). The support for these are targeted for shipping in release Firefox 62.
set which resolver mode you want. 1 - Race native against TRR. Do them both in parallel and go with the one that returns a result first. 2 - First. Use TRR first, and only if the name resolve fails use the native resolver as a fallback. 3 - Only. Only use TRR. Never use the native (after the initial setup). 4 - Shadow. Runs the TRR resolves in parallel with the native for timing and measurements but uses only the native resolver results. 5 - Off by choice This is the same as 0 but marks it as done by choice and not done by default. (default: none) set the URI for your DOH server. That's the URL Firefox will issue its HTTP request to. It must be a HTTPS URL. If "useGET" is enabled, Firefox will append "?ct&dns=...." to the URI when it makes its HTTP requests. For the default POST requests, they will be issued to exactly the specified URI. (default: none) set credentials that will be used in the HTTP requests to the DOH end-point. It is the right side content, the value, sent in the Authorization: request header. (default: false) set this to true to allow RFC 1918 private addresses in TRR responses. When set false, any such response will be considered a wrong response that won't be used. (default: false) When the browser issues a request to the DOH server to resolve host names, it can do that using POST or GET. By default Firefox will use POST, but by toggling this you can enforce GET to be used instead. (default: example.com) Firefox will check an NS entry at startup to verify that TRR works to ensure proper configuration. This preference sets which domain to check. The verification only checks for a positive answer, it doesn't actually care what the response data says. Set this to skip to completely avoid confirmation. (default: none) by setting this field to the IP address of the host name used in "network.trr.uri", you can bypass using the system native resolver for it. (default: 60) is the number of seconds a name will be kept in the TRR blacklist until it expires and then will be tried with TRR again. The default duration is one minute. Entries are added to the TRR blacklist when the resolve fails with TRR but works with the native resolver, or if the subsequent connection with a TRR resolved host name fails but works with a retry that is resolved natively. When a host name is added to the TRR, its domain gets checked in the background to see if the whole domain should be blacklisted to ensure a smoother ride going forward. (default: 3000) is the number of milliseconds a request to and corresponding response from the DOH server is allowed to take until considered failed and discarded. (default: false) For each normal name resolve, Firefox issues one HTTP request for A entries and another for AAAA entries. The responses come back separately and can come in any order. If the A records arrive first, Firefox will - as an optimization - continue and use those without waiting for the second response. If the AAAA records arrive first, Firefox will only continue and use them immediately if this option is set to true. Go to about:networking, click the DNS link in the left-side menu. That shows the contents of the in-memory DNS cache. The TRR column says "true" for host names that were resolved using TRR (DNS-over-HTTPS). I was wondering if the web developer tools or some other tool in FF have an option to follow the DoH queries. I would like to see the actual HTTP-request. Who thought this would be a good idea? Do you work for Cloudflare? Once upon a time this kinda thing was posted as an RFC. Now people just implement stupid ideas without first talking it over. The support for these are targeted for shipping in release Firefox 62. So it won't be enabled in this version? Why is network.trr.early-AAAA set to false by default? How does this relate to the rest of the Happy Eyeballs implementation? The best practice is / should be to try and use IPv6 from AAAA responses unless IPv4 is measured to be significantly better. Using a faster DNS response for A records is a poor reason to select using IPv4. See RFC8305 for current best-practices. Google DNS doesn't work in TRR mode 3, domains don't get resolved at all, Firefox says Server not found. Why ? @phonphen I inserted 8.8.8.8 and it still doesn't work, probably an issue with Firefox itself. is dump me to closer regional properly. i dunno much on tech aside but tested both with Force mode(3) and seems alright on both. so i've choose closer regional one. during FF60~61 period is quite broken and not worked well. now seems works fine with FF62 i guess. 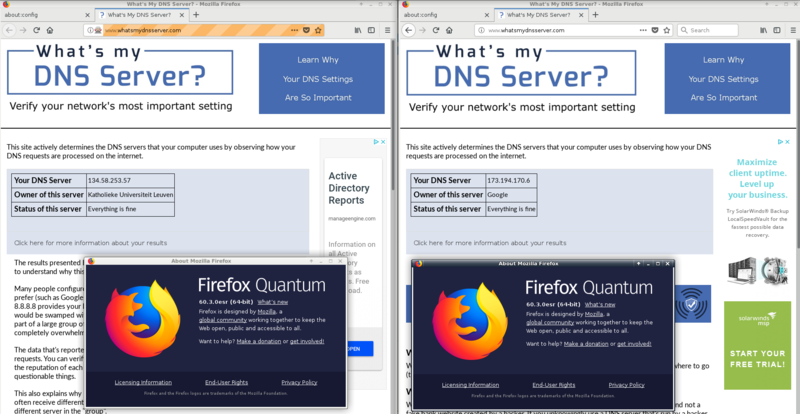 To use Mozilla's TRR you have to use https://mozilla.cloudflare-dns.com/dns-query - this activates Mozilla's strong privacy agreement on servers operated by cloudflare. Those are located all over the world. You dont have to think about "closer regional"! I guess that should indeed be changed in mozilla's wiki! Yeah, 1.1.1.1 or 104.16.112.25 or whichever already Cloudflare's DNS is fastest and less latenrcy then other DNS for most of users living in asia-pacific regions so which ever pick doesn't affect much. theoretically this is should be describe clearly by Mozilla themself..
anyone got a contacts or know persons in that part? bugzilla couldn't be good for asking this..
so.. that means trr.uri is always priority to check resolver by web browser(ff in this case) so bootstrapAddress isn't important to put value on there right? You have to make sure that dns.google.com resolve to 8.8.8.8.
dns.google.com NEVER resolve to 8.8.8.8 for me but 172.217.31.110. that's why you can't use 8.8.8.8 as bootstrapAddress. [...] so bootstrapAddress isn't important to put value on there right? it is, i'm afraid. if you choose TRR mode 3.
so anyway leave it(bootstrapAddress) empty for now.. is best? some of dns packet detect & manipulate nation's users need to proper test on these settings if there's further change on values. as i've confirm, Android Firefox is flush those values on every application updates..
so highly suggest this website for test dnsleak after every trr settings apply. Leave empty will use the system native resolver. Should work "best" in the most cases: It will most likely be the ISP of your current connection. It seems trr prefs don't work when FF is driven by selenium, anybody experienced the same issue? Could you confirm what "network.trr.max-fails" is about? I assume that it's the maximum number of retransmissions after giving up resolution for the current domain name -- the timeout for each query being network.trr.request-timeout millisec. Good stuff, thanks. What about the 'network.trr.disable-ECS' option? network.trr.disable-ECS If set, TRR asks the resolver to disable ECS (EDNS Client Subnet). Some resolvers will use ECS to the upstream if this request is not passed on to them. Another one to add to the list of possible resolvers (network.trr.uri) is Quad9's DoH service. that's why you can't use 8.8.8.8 as bootstrapAddress. So how come I can use 1.1.1.1 even though cloudflare-dns.com never resolves to 1.1.1.1 ?